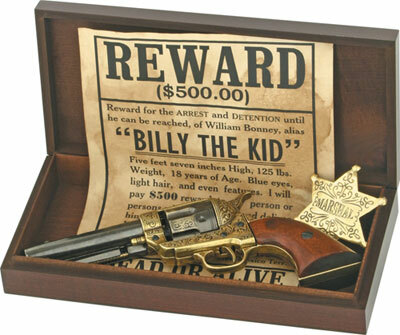 Billy The Kid Boxed Set features a deluxe simulated gold engraved M1873 Fast Draw Replica. One Wanted Poster offering a $500 reward for this famous outlaw dead or alive. One deluxe brass engraved Marshal's Badge. Comes with a hand-made wood box display with walnut finish and hidden hinges. Buy this beautiful gift set for $119.99. John Wayne Collector Set for sale is attached to a 22 inch by 9 ¼ inch wooden frame. This collector set features a non-firing Army M1873 replica, a single-loop holster and a display plaque that is engraved with the signature of John Wayne. The Army M1873 replica is non-firing and can be removed from the single-loop style leather holster. It has a 5 ¾ inch barrel and imitation John Wayne grip. The holster and replica M1873 are attached to the handsome wood display. The signature of John Wayne is engraved into the wood at the bottom of the bevel edged display. The top of the display features a plaque that is engraved with John Wayne, 1907-1979, American Icon. Buy the John Wayne Collector Set for $159.99. Brass Finish Cartridge Replicas are made to fit any of the Denix replicas. They are solid metal castings and cannot be made fireable. 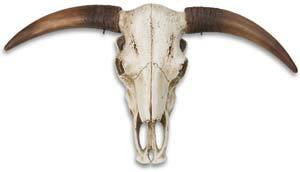 Each set includes six bullet replicas that are 1/4 inch in diameter and are 1 1/4 inches overall. Complete your replica with these unique additions for only $11.99.